Celtic are top of the SPL Christmas tree after beating Rangers at Celtic Park. 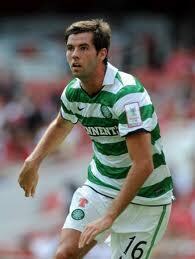 A second half Joe Ledley header was enough to claim all three points for Neil Lennon’s men in the Old Firm encounter. Celtic were value for the win to make it nine victories on the trot. Having trailed by 15 points on 5 November with two games in hand, Celtic now go into the new year with a two-point advantage in the title race. Celtic did most of the pressing in a disjointed first half but the best chances fell to the visitors, who have now dropped 11 points in their last seven outings. Six minutes had passed when Wallace raced in at the back post to meet Sone Aluko’s cross from the right but Forster made a terrific save to claw the midfielder’s close-range header away. Television replays later suggested the ball had crossed the line but there was little in the way of protest from the men in blue. On 23 minutes, an Aluko corner was nodded down by Nikica Jelavic and Bocangera could only awkwardly scoop the ball wide from inside the six yard box. Rangers goalkeeper Allan McGregor was kept busy, but the saves he made to keep out shots from Scott Brown, Gary Hooper and James Forrest were routine. Georgios Samaras found the net after reaching the scraps from Hooper’s effort but the Greek striker had strayed offside. McGregor fumbled under pressure from Samaras but the ball fell kindly for the Rangers defence before the Scotland keeper smothered another shot from Hooper. Celtic started the second half well, with Kyle Bartley and Bocanegra making vital blocks to thwart the home side and McGregor tipping over a rising strike from Forrest before Ledley made the breakthrough. The Wales international beat Kirk Broadfoot at the back post to power in a header from Mulgrew’s corner kick. Buoyed by the goal, Celtic had Rangers pinned back, with the visitors defending desperately in and around their penalty box. The game grew increasingly ugly and scrappy as Beram Kayal was stretched off after a crunching tackle from Lee McCulloch and Rangers substitute David Healy was guilty of a dreadful hack at Forrest. Kyle Lafferty joined Healy in referee Collum’s book for a lunge at Adam Matthews, while Anthony Stokes picked up a caution for a spot of retribution on the Northern Irishman. Rangers launched a series of hopeful balls forward in the closing minutes but Celtic snuffed out the danger with ease.